We’re kicking off the fifth season of Third Tuesday Toronto (#TTT) with something special: a day long conference on social media measurement. “Are we there yet?” “How much longer before we arrive?” Every vacationing parent recognizes these words as the first expression of our need to know where we are and what progress we’re making. Measurement matters. It’s how we know whether our efforts are having any impact. It’s how we know whether we’re making progress toward a goal or whether we’re stalled. We measure what’s important to us. We measure to understand what is going on. We measure to provide insight into what works and what doesn’t. Measurement really matters in emerging and fast changing fields. And social media is a field that is evolving rapidly. Evolving in participation, as it transforms from something for early adopters to a part of mainstream life. Evolving as new tools and platforms proliferate. Evolving as people adopt it and find new uses for it. Anyone who uses social media for their work or is serious about it must understand what we can and should measure and how we can do it. That’s where Third Tuesday Measurement Matters comes in. Many smart people are spending a lot of effort figuring out measurement methodologies and developing new metrics and measurement tools. They’re developing insight into the nature of participation in social media and the new patterns of social interaction. They’re developing new metrics to measure these new interactions. And they’re developing suites of tools that enable us to monitor, measure and analyze what’s going on in social media. We’ll be inviting leading experts in social media measurement and companies who are developing the measurement tools to participate in Third Tuesday Measurement Matters. They’ll talk about the measurement challenges we face and offer their thoughts on how we should tackle these challenges. They’ll also demonstrate the best tools we can use to measure social media. We want this conference to deal with the issues that interest you and answer the questions that matter to you. So, we want your input into what we should discuss and who you think has insight to offer on the important issues. In the coming days, I’ll post a preliminary agenda and ask for input on the topics that you’d like to discuss and the speakers you’d like to hear from. Check back here in the next few days for more information and your opportunity to shape the agenda and lineup of speakers. Third Tuesday Measurement Matters (#TTMM), Toronto, September 28, 2010. We have a special Third Tuesday Toronto on Feb. 23. It’s special because we’re holding it in conjunction with Personal Brand Camp – a project being undertaken by Michael Cayley for the Humber College social media students. During the afternoon, the Humber students will meet with volunteer mentors to discuss the importance of their online personnas, the issues involved and how they can develop an online brand that will be consistent with the people they are. Then, in the evening, Mitch Joel will be our featured speaker at Third Tuesday. Mitch has built a remarkable personal brand. He is well known and widely respected as a marketing thought leader. This year, he published Six Pixels of Separation, a handbook to digital marketing and social media. He’s often referred to as “Canada’s Seth Godin.” That’s no small feat. Mitch will offer us his perspective on the concept of personal brand. Does he build his brand consciously? Are there rules, implicit or explicit, that he applies in doing this? Is personal brand building something that we all should be engaged in? What advice would he offer to anyone concerned about the image they project online and in the real world. Interested? 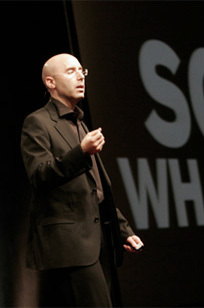 Register online to attend Third Tuesday Toronto with Mitch Joel. Thank you to our sponsors – and thank you to our speakers.